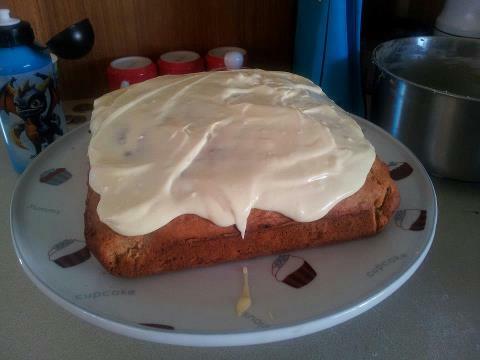 I had a few over ripe banana’s lying around today and so I thought I would make a banana cake. I looked through my cake books and could find one that was simple so I looked online and found this gem. It was quick and really easy to make and took me about 10 mins to whip up. It tastes great too! I didn’t use the lemon frosting recipe as I had no lemons so I decided to make my own with what I had. I just used half cream cheese, half butter and then added icing sugar until it got to the sweetness that I liked. It’s still warm and I am eating my first slice now. It is divine. Are you baking anything nice today? « I always cry in kids movies. That looks amazing. Please tell me there are chocolate chips in there!! The only thing I made today was a taco salad with turkey meat. i mixed ranch dressing and salsa together for the salad. So good! haha.. I had no chocolate chips so sadly no… I have an awesome recipe for a choc banana cake that has a sour cream type choc frosting that I used to make heaps because every one loves it! it’s one of the dirtiest pages in my cake book! I will have to make it and put up the recipe! omg that sounds amazing too. The banana cookies I make are super easy too. yum that sounds so good!!! I think i might make them next time I have left over bananas!! I love them. I could eat the entire batch…which you could and NOT feel guilty about it since there’s nothing bad in them! !